Is there a better alternative to PolyRoots? Is PolyRoots really the best app in Mathematics category? Will PolyRoots work good on macOS 10.13.4? 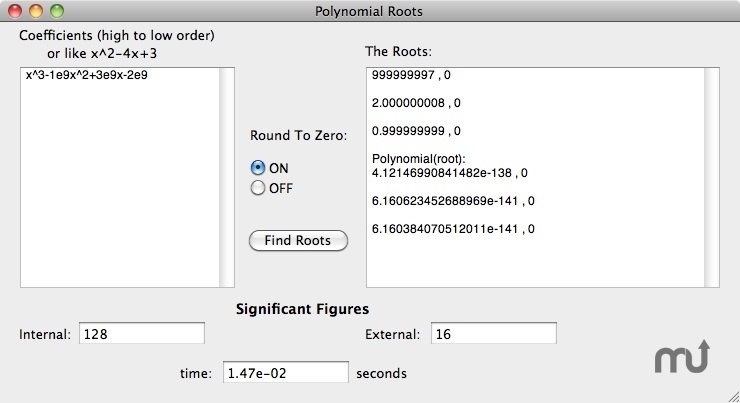 PolyRoots finds the roots of a polynomial to any chosen accuracy using Laguerre's Method. The coefficients of the polynomial can be real or complex. PolyRoots uses my own multi-precision engine, fp. PolyRoots is released as freeware, with no restrictive licenses. PolyRoots is a Universal Cocoa application. Adds the ability to set "Round To Zero" ON or OFF. PolyRoots needs a review. Be the first to review this app and get the discussion started! PolyRoots needs a rating. Be the first to rate this app and get the discussion started!